Living in a city, we lose touch with nature. More people start to realize how far they get from materials such as wood, and they try to bring pieces of nature into their daily lives – to their interior design, eating habits, and style. As the eco-friendly fashion market continues to grow, new crops of labels are taking the industry by storm. One of the pearls we want to share with you today is a young European brand that brings joy to people with handmade wooden accessories – BeWooden. Their products, which are made of natural materials, are a constant reminder of the beauty that lies beyond the city walls. All the products are made by hand, sealed with environmentally-friendly coatings and have a kooky design. Today, BeWooden continues to focus on three key points in the production. The product should be: environmentally-friendly, stylish, and unique. They continue to follow industry standards for sustainable design. Sacrificing style for sustainability is unneeded – it’s all about a combination of recycling and urban design. In every accessory designed and produced, BeWooden focuses on using environmentally-responsible materials. Making a casual or business look cheeky is possible with a wooden bowtie designed in different shapes and one-of-a-kind patterns laser-engraved onto the wood. BeWooden‘s chic, casual, or classic wooden bowties are sustainable, environmentally-friendly and a true companion for any occasion. The company was found in Czech Republic in 2013. Within the last three years, they expanded the market to Germany, Denmark, Sweden, and Belgium. At the moment, the collection entails many products, from wooden cufflinks to wooden mirrors and many more. Moreover, a new product configurator allows creating your own product with a wood type and colour handpicked by the customer. The amazing thing about working with wood is that every product looks different. Each piece of wood has its own pattern, therefore, every product is completely unique. 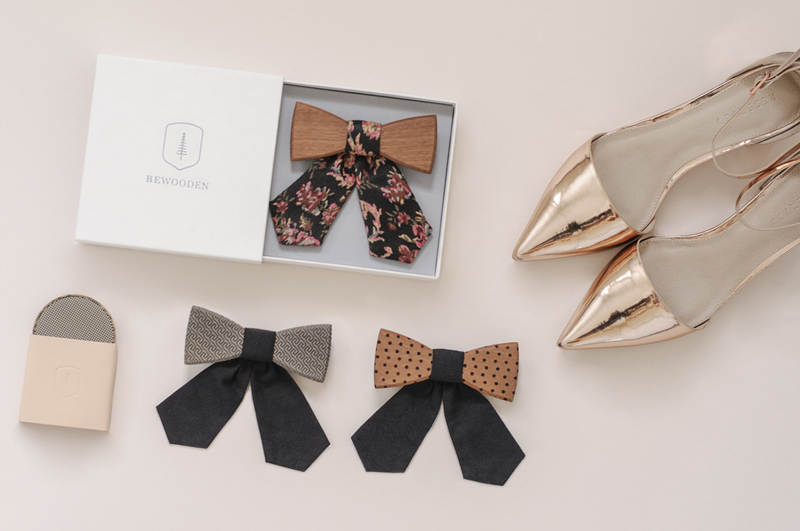 BeWooden uses very lightweight types of wood, as their bowties weigh only around 25 grams. In BeWooden, people understand that sustainability is a process that embodies a vision for the future. It is measured by what is sometimes called “the triple bottom line”—the social, economic and environmental outcomes of business on people, economic competitiveness, and the natural world. They prefer an upcycling method of production, where the remains of used wooden furniture pieces are reshaped, decorated with a laser pattern, and usually engraved. BeWooden is constantly creating new products. In April 2017, it was announced that a new accessory, the beaded pearl bracelets, made of noble woods and charming stones, will be launched.